The Antillean manatee is an endangered species in Belize. Unfortunately, death reports of these large mammals are increasing annually. On Tuesday, December 6th, a seven-foot manatee was found dead at the mouth of the Placencia Lagoon, and was later transferred to the Belize Wildlife and Referral Clinic (BWRC). 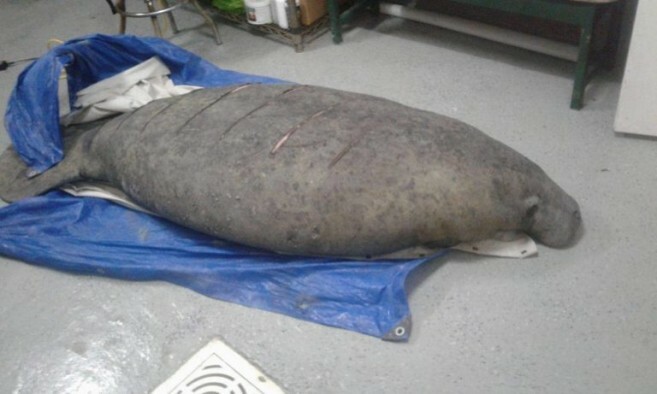 After being examined, it was determined that the manatee died due to a collision with a boat. The manatee received eight propeller cuts across its entire back. Of the eight, three penetrated into its body cavity, which led to broken ribs and ruptured kidneys. One of its lungs ruptured as well, causing fatal bleeding. As one of their largest patients so far, the manatee’s weight exceeded the clinic’s scale, and the mammal’s weight was undetermined. BWRC stated that this accident could have been prevented if the boat captain respected no wake zones, and looked out for these large mammals moving. According to the Coastal Zone Management Authority and Institute, manatees are important in many ways: i) They are part of Belize’s rich biological diversity; (ii) the Antillean manatee population in Belize is the greatest for any country in its range; (iii) they are an indicator of species ecosystem health; (iv) they are a part of our cultural heritage; and (v) they provide diverse opportunity for tourism. The San Pedro Sun contacted Belize Manatee Conservation Program Coordinator Jamal Galvez for some figures relating to the manatee population, and for comments on the latest manatee loss. “I won’t say that the number of manatees are decreasing or increasing, but we estimated to have around 1,000. Whenever manatees are hurt or injured, it is of grave concern to me. However, the number of manatee deaths has increased over the years. Some of these deaths can be avoided if the public used more caution. Hitting a manatee with a boat and leaving it there is unacceptable. It is the public’s duty to contact us for help. Maybe if we were contacted, we could have offered this manatee some assistance, and it could have been saved,” said Galvez. He strongly advises all boat owners to always be careful. “We continue to emphasize that boaters need to be alert, especially when traveling in areas that manatees are known to hang out. Most of these are marked with signs in no wake zones or something to notify these boaters. We also ask them to avoid shallow waters because manatees like to feed on the seagrass beds. If everyone is vigilant of their surroundings, I believe that our country can preserve this endangered species,” said Galvez. The Belize Manatee Conservation Program also shared some valuable tips whenever you spot these large mammals. 1) If you’re near manatees: don’t touch them, only look; don’t chase a manatee while in the water nor in a boat; don’t separate a mother and her calf. 2) If you’re on a boat: abide by posted speed zone signs in manatee areas, look out for manatees in manatee areas; listen for it surfacing to breathe; notice the animal’s back, snout, tail or flipper break the water’s surface; also notice swirls in water from them diving, and try to stay in deep water channels. For tour operators: slow boat to idle speed when 100 yards from manatee site, drift or pole into position once within 75-100 feet of site, and please don’t throw trash where manatees splash. 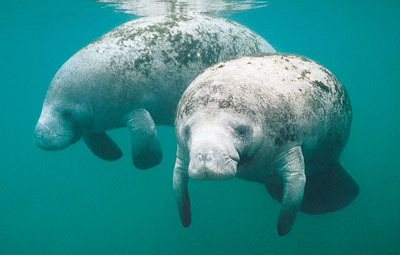 Although Belize has the largest population of the Antillean manatees, is still a small number and considered threatened. To avoid manatee boat collision-related deaths, boaters are cautioned to drive carefully in these areas: Swallow Caye, Moho Caye, Port-O-Stuck, Drowned Caye, Hicks Caye, Bluefield Range, Rider Caye, Turneffe Atoll, Placencia Lagoon, Chetumal Bay, Port of Honduras Area, Indian Hill Lagoon, Deep River, Belize River, Monkey River, Rio Hondo, and Mullins River. The general public is reminded that manatees are protected in Belize under the Wildlife Protection Act, No. 4 of 1981. Jurisdiction is under the Forest Department, Ministry of Natural Resources. Under this Act, no person shall hunt, meaning “to kill, molest by any methods and includes attempting to kill, take or molest by any method” any manatee. Anyone who hunts a manatee will be fined $500 on a first offence, and $1000 and/or imprisonment for six months, for previously convicted wildlife offenders. BBQ Blast Fundraiser closes a successful August for Saga!